Last time I shared a related posts widget with you which helps in seo and increasing blog traffic, today I am sharing a content slider widget which slides your posts one by one. 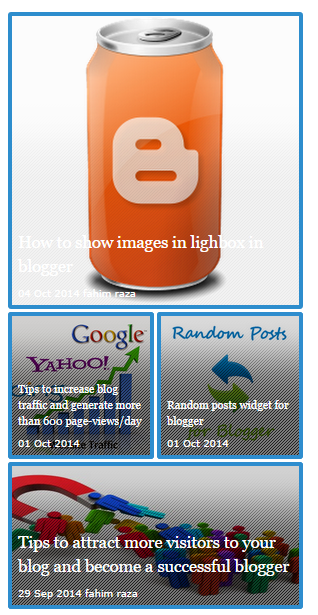 It is also helpful in increasing blog traffic you can see it in my blog on right side of the blog. This widget works on Css and jquery. Its free of cost you don't need to pay for it. It works automatically, you don't need to add each post it will get posts of your blog by itself and show it in random break. It is very attractive and responsive. You can adjust number of posts in this widget. It is very easy to add this widget(don't need to add many codes). This widget is better than other content sliders. You can find a number of content sliders on search engines but most of them are difficult to add and also requires hard work to update because you have to add posts links and images and it becomes more difficult when you have a large content. So this widget is much better than other content sliders because of several reasons such as you don't need to update it by adding image of each post and link, secondly it is attractive, you can show a number posts by just changing number of posts, no need to register account, it doesn't effect you blog speed, it is very easy to add it and so one, you can see its features above. Select Layout and click on add a gadget. Replace http://101helper.blogspot.com with link of your blog in the last of the code. After following above steps click save and you are done successfully, open your blog to see content slider. I have set number of posts to 20 posts, it means that this widget will slide 20 recent posts by equal interval of time, to change number of posts change Maxpost:20 to number of posts which you want to show. The default images size is 300 to change it replace 300 in ImageSize:300 with your own choice. This widget slides posts automatically, to turn of automatic slide change true with false in autoplay:true in last lines of the code. To change time of sliding posts change 5000 with your own choice in interval:5000. You can customize this widget more such as adjusting image size, images position, color, hover effect, font size but don't do it unless you know css, if you don't have knowledge about css but still try to customize it then may be this widget stop working. Thanks for visiting 101helper, if you like this post or if you have any problem related to this post leave a comment below. Share this post with others. Follow and subscribe by E-mail to 101Helper to get latest news about blogger gadgets in your inbox or join 101Helper on Facebook, twitter and Google+. Tags: Content slider, gadget to show posts, posts slideshow gadget, Content slider for blogger, show related posts, random posts slider gadget for blogger, 101Helper blogger widgets. Have looked at over a dozen HTML/Script random post widgets. This one works right and has features and visual action that surpassed the others. Strangely, while it is still great in many browsers, it is not visible, in Internet Explore 11. Has to be an IE problem. Yes it might be outdated but in other browsers it works perfectly.